I’ve seen and heard bands of all shapes and sizes on the stage at the Dakota Jazz Club, from solo performances to the 17-piece Mingus Big Band—so large for the club space that a row of musicians occupied what normally would be space for a half dozen tables. Obviously big band music is intended to be played by a large ensemble, and even in a relatively small room the music fills the space without overpowering it, thanks to a high tech sound system and expert sound engineer. But often, particularly when the focus is on a vocalist, it seems that musicians are often added beyond critical mass without adding quality—just quantity. This is not a characteristic of Christine Rosholt’s ensembles, which tend to range from trio to sextet. A singer with a relatively short resume (she celebrated five years of public performance last fall), Christine is long on business sense and presentation, which might explain why she is one of the busiest, wide-ranging vocalists in the area. It’s not unusual for Christine to have three or more gigs in a given week, and at venues ranging from supper club to jazz club, from Minneapolis to Bay City, Wisconsin or the North Shore. The fact that she is an increasingly accomplished singer constantly adding new material to her repertoire is of course part of the reason for her popularity, but another significant factor is her choice of musicians. 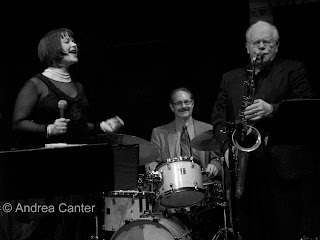 She’s often supported by pianists Chris Lomheim or Tanner Taylor, two marvelous accompanists with very different styles; bassist Graydon Peterson, a young UW-Eau Claire grad who has surprising facility backing vocalists; drummer and choreographer of all things percussion, Jay Epstein; and everyone’s favorite tenor sax man with the famous red socks, Dave Karr. Musicians constantly make choices on stage, selecting notes, tempos, adjusting phrasing, stepping back and stepping up, deciding what tune to call next….And sometimes those choices are not so much about what or how to play, but who will play. Here, Christine Rosholt makes wise and satisfying choices. 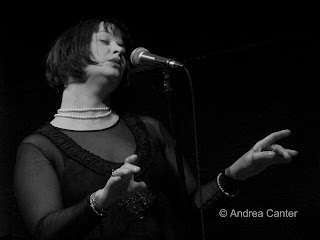 Photos: Christine Rosholt; Christine with Jay Epstein and Dave Karr at the Dakota, March 24, 2008. Photos by Andrea Canter.